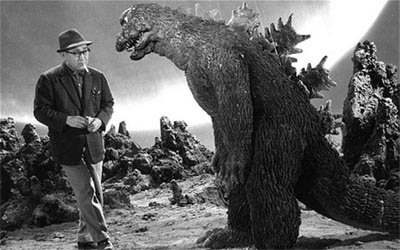 Godzilla stares down the army in a publicity still from his first film in 1954. In 1954, Japanese film producer Tomoyuki Tanaka was pondering the recent, accidental exposure of some fishermen to radiation from an American H-bomb test when suddenly he had an idea for a film. It would feature an aquatic, lizard-like creature grown to gigantic proportions by atomic radiation. His beloved skyscraper-high creation would eventually be featured in over 30 films and be adored by monster movie fans around the world. On March 1, 1954, the United States tested the first hydrogen bomb that was small enough to fit into an aircraft. The experiment, code named Castle Bravo, took place at Bikini Atoll part of the Marshall Islands in the Pacific. Scientists miscalculated how large the blast would be, however, getting a 15-megaton explosion instead of the 6-megaton one they expected. Because of this, the resulting fallout area was enormous and a small Japanese fishing trawler, Lucky Dragon 5, its crew and cargo got irradiated. The event caused an international incident. Concerns were particularly high in Japan that such tests might contaminate the country's food supply, much of which came from the sea. It was during this period that Tomoyuki Tanaka, a producer for the Toho Motion Picture company, found himself flying back from an unsuccessful attempt to negotiate the filming of a movie in Indonesia. The cancellation of the film left a hole in Toho's production schedule that Tanaka needed to fill as quickly as possible. Tanaka had an interest in monster films and had been reading in a trade magazine about the production of an American movie called The Beast from 20,000 Fathoms. The film told the tale of a dinosaur frozen in the Arctic which was resurrected by an atomic blast. The creature then swam south and laid waste to New York City. Tanaka realized that he could use the H-bomb tests in the Pacific as the backdrop for his own monster story. He quickly wrote an outline about a prehistoric creature that emerges out of the sea to assault Tokyo. He gave it the working title of The Giant Monster from 20,000 Leagues Under the Sea. The studio decided to approve the movie's production with Eiji Tsuburaya as the visual effects expert and Ishiro Honda as the director. A name was needed for the creature and legend has it that an especially strong employee of the company sported the nickname Gojira, which was a combination of the words for gorilla and whale. The film crew soon started calling the creature in the film this name, which in English is Godzilla, and it stuck. Ray Harryhausen's Beast from 20,000 Fathoms inspired producer Tanaka to create Godzilla. One of the first questions the production crew had to tackle was how to bring the monster to life. The Beast from 20,000 Fathoms had Ray Harryhausen as its visual effects expert. Harryhausen was an expert at a technique called stop motion animation. 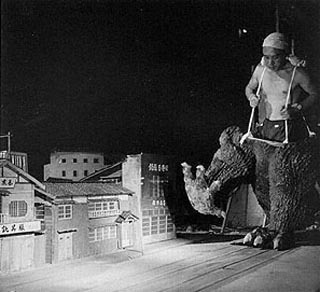 This method had been used before (notably in the film King Kong) and it involved creating a miniature set with a poseable puppet of the monster. The action was then filmed one frame at a time with the puppet being manipulated between each shot. When the film was developed and played back at full speed, it would appear as if the puppet was moving by itself. Doing good stop motion animation, however, was a time-consuming and exacting process. Tsuburaya estimated that with his current resources and expertise, filming Godzilla via stop motion would take around 7 years. This was far too long as Toho's management wanted the picture in the theaters by the end of the year. While Toho Studios had little familiarity with stop motion, it did have many artisans with extensive experience in building scale models. During World War II the studio had made a number of propaganda films sponsored by the government. These included complex battles scenes (such as the attack on Pearl Harbor) reproduced in miniature. Some of the battle scenes were so convincingly real that they wound up in documentaries after the war. 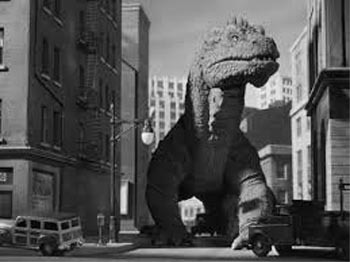 Though it had never been done before, Tusburaya decided he could build miniature sets scaled to a human-sized monster that was actually an actor in a rubber suit. If the man in the monster suit was filmed with the camera running at several times normal speed (240 frames a second), he would move in slow motion, helping with the illusion that he was many hundreds of feet tall. Eventually this technique, pioneered by Tusburaya, would get the name Suitmation. One of the first concerns was to come up with a design for the monster and actually build the suit. A popular comic book illustrator, Wasuke Abe, was hired for the job, but his creation turned out to be very abstract (the creature sported a head the shape of a mushroom cloud) and not what Tusburaya wanted. During an interview with the artist, however, they looked at illustrations that featured a Tyrannosaurus Rex. As it turned out this was to have a major influence on their final vision. The half suit in operation. A sculptor was commissioned to make several models of the monster in clay with different characteristics. In the end, the filmmakers decided on a version of the creature that was a cross between a T-Rex and an iguanodon with plates down its back like a stegosaurus The monster also was given alligator-like skin. Nobody had ever built a monster suit like this so the Toho crew was on their own to figure it out via trial and error. They started with a chicken-wire frame which was coated with layers of hot latex rubber. The details of the creature's skin and features were created separately and glued onto the top layer by the studio's artists. When it was time to test the suit with an actor, the final product looked wonderful, but was so inflexible and heavy that the actor collapsed after only taking a few steps. It became clear that the suit was too heavy and stiff. It would have to be built over again. This time the crew chose a more flexible form of rubber and tried to minimize the weight. Even so, the creation weighed in at 220 pounds and with little ventilation was suffocatingly hot. One of the two actors who shared the role, Haruo Nakajima, claimed he had to drain a cup of sweat out of the suit after filming each scene. The original latex suit, however, was not wasted, but with the top cut off and suspenders added, was used in close up shots of Godzilla's feet as he rampaged through the city. The filmmakers not only wanted to get the Godzilla suit itself correct, they also wanted accuracy in the locations the creature would ravage. They spent an enormous amount of time looking at and taking pictures of real locations they wanted to reproduce in miniature for certain scenes. Once, while standing atop the Matzuzakaya Department store, they discussed which of the buildings in the surrounding area would be set on fire or destroyed in the film. Someone overheard their conversation and by the time they reached the building exit, they were stopped by the authorities and had to answer some questions about their conversation. Fortunately, after identifying themselves as filmmakers, they were allowed to go on their way. Shooting started in August of 1954 and it was not without its difficulties. The actors inside Godzilla, Haruo Nakajima and Katsumi Tezuka, found working conditions to be grueling. The suit itself was hot and when put under the brilliant studio lights, it became almost unbearable. The actors also had to contend with the smell of burning kerosene used to light the miniature sets of Tokyo ablaze. On one occasion Tezuka and several of the crew were almost electrocuted when a live cable fell into the pool set in which they were shooting a water scene. There were cases when actors inside Godzilla fainted in the middle of a scene as they were overcome by the heat and lack of ventilation. The director with his star on the set. The actors entered the suit through an opening that ran in between the dorsal fins which was then zippered closed. Because the costume was taller than the actors, their heads were actually located in the creature's neck area. Tiny holes had been put in the suit here to allow the actors to see out and get air. Unfortunately, during filming the holes clogged up with sweat and often the actors found themselves operating with nearly no vision at all. Though Haruo Nakajima and Katsumi Tezuka did the work inside the suit, they were not the only people responsible for Godzilla's performance. Cables were used to control the motions of his eyes, and another cable was connected to his tail to control which way it would swing. The production finished on time, but because of all the special effects and miniature work Godzilla turned out to be the most expensive motion picture made in Japan up to that time. With a price tag of over one hundred million yen ($1.5 million in 1954 dollars), it was an enormous financial gamble for the studio. Fortunately, Godzilla was a huge success and a sequel was soon in the works. Godzilla Raids Again was the first of many encores for the giant lizard. The next year a group of American investors purchased the international rights to Godzilla. 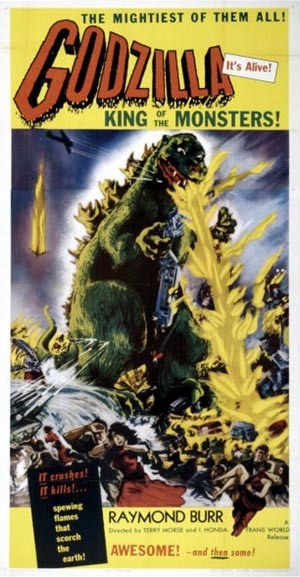 They believed the film would be more successful if it included an American actor, so they hired Raymond Burr (who would later become well-known for his portrayal of the TV lawyer, Perry Mason) to play the part of a U.S. reporter covering the attack of Godzilla in Japan. A number of new scenes were shot over the course of five days. These were then inserted into the original film and it was released to U.S. audiences in 1956 as Godzilla, King of the Monsters. It was a box office hit. 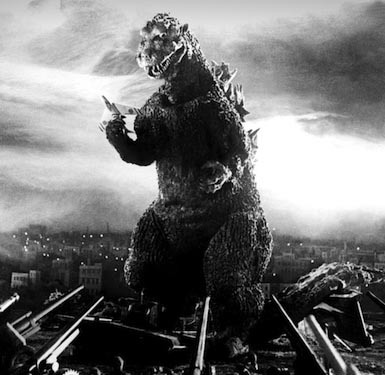 To date, Godzilla has appeared in 30 films. Some of these include King Kong vs. Godzilla, Ghidorah, the Three-Headed Monster, Son of Godzilla, The Return of Godzilla and Godzilla Against Mechagodzilla. As the Tokyo skyline has gotten taller, so has Godzilla so that he continues to dominate the landscape. In the original 1954 film he stood about 160 feet (50m) high. By 2014, in the U.S. movie of that year, he had grown to 350 feet tall (106 meters). His recognition is worldwide, but he is particularly popular in Japan where he has become a national icon. Over the course of the movies Godzilla has become a sympathetic figure, occasionally battling other monsters to save his adopted home. He doesn't like humans, but will team up with them against common threats. He has also spawned a number of spin-offs and competitors. The term Kaiju (which translates to "strange creatures") is the name of this genre. It includes Toho's giant sized hero Ultraman, as well as Daiei Motion Picture Company's rival monster Gamera. How long will Japan's most admired monster continue to make films? Given his popularity in his homeland, as well as around the world, it looks like we will be seeing the giant lizard for many, many more years.